IELTS reading, paraphrasing, skimming, scanning in IELTS reading. IELTS academic and general exam. 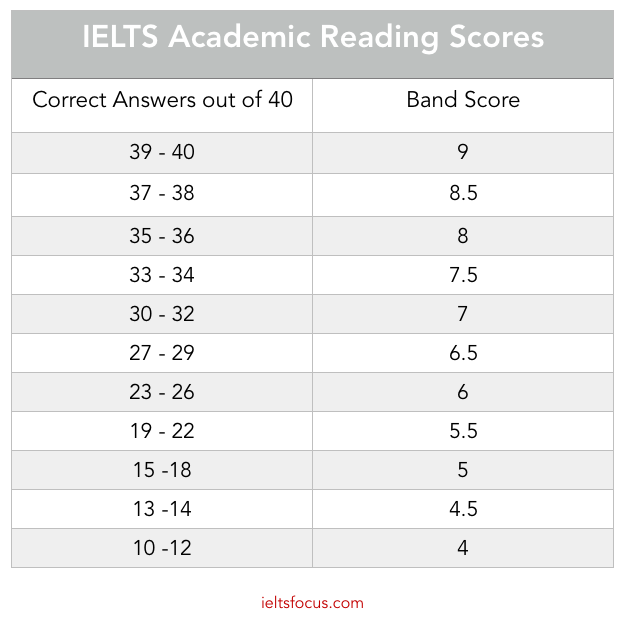 The IELTS reading test has 3 sections. The IELTS Reading exam lasts for 1 hour. You will need to answer all questions and mark your answers on a separate answer sheet, unlike the listening test you will not be given extra time to transfer your answers to the answer sheet, so write your answers on the answer sheet at the same time. 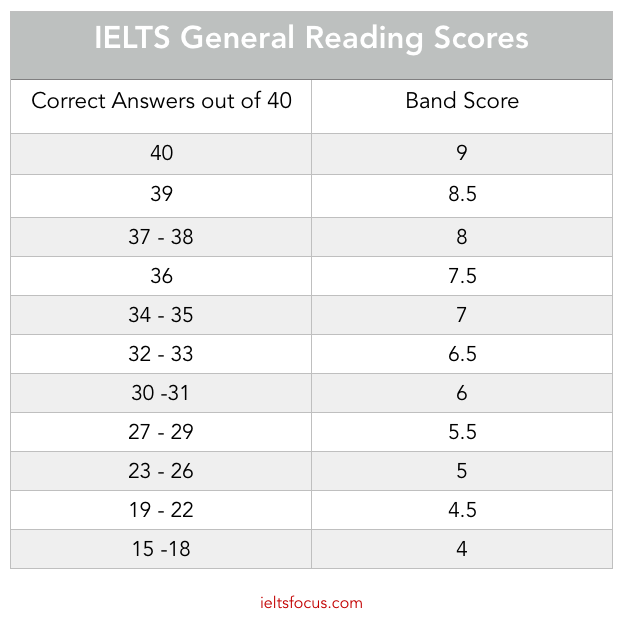 The IELTS academic reading test is a little different from the IELTS general reading test as the texts are a little more difficult. The IELTS academic readings are longer and use more complex vocabulary, sometimes there may be a diagram to complete or some kind of chart. Academic topics are taken from scientific journals or magazines for example. The IELTS general reading test relates to everyday life such as work, school, home life, advertisements, technology, vacations, making an application and so on. The last section of the general test is the most difficult. For both types of test, it is advised that you spend about 15 minutes on section 1 and 2 and 30 minutes on section 3. There are 3 passages with 40 questions in total. Free online IELTS reading tests from the British Council. What type of questions are there in the IELTS reading exam? There are many different types of questions that could come up in this reading test. Each reading text has about 4 various types of questions. So for each passage, you might get True False Not Given, Matching a heading, Summary completion or Multiple choice. Click below on the types of question for a lesson on each one. What kind of strategies are useful? 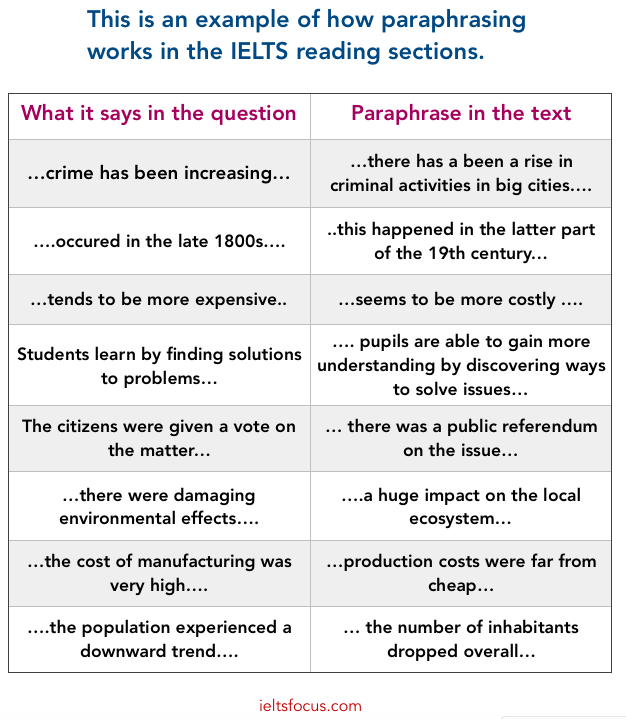 Skimming is important in IELTS Reading to get an overview of the text and it should take about 2 minutes. This skill is useful for short answer questions or multiple choice questions, but for other question types, this might not work well. Understanding how things are paraphrased is a very important skill because in the text it will say one thing but in the answer choice it will use synonyms, this can really confuse students. Scanning is another technique that is useful to locate key information such as numbers, names, dates and other key information but this also depends on the type of question. Read in Detail: In many question types, you will need to concentrate and read the area in the paragraph where you think the answer could be in detail to get the answer. This is something IELTS students neglect as they are told to just scam and skim. However, you should not read the whole text from beginning to end. Vocabulary knowledge is a key skill in this situation. Developing the ability to understand how sentences are paraphrased is a key skill. See the examples below. Remember that you do not need to read everything or understand the whole text, you are just looking for the answer to the particular question so it is not necessary to read the whole text in detail, you need to hunt down the information that you need to answer the question. Understanding synonyms, collocations and the way sentences are paraphrased are crucial skills needed here, it is not about just matching words that are similar, you need to understand the meaning. 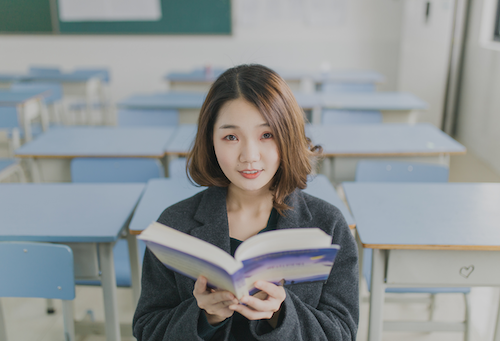 Here are the best techniques for reading in IELTS. 1. Look at the questions before reading the text. 2. Skim the text to get a general idea of what it is about. 3. Scan for more detail (numbers, dates, names, places etc..). 4. Read the paragraph in detail where you believe the answer could be. 5. Become familiar with how paraphrasing and synonyms work. 6. Make sure you understand the instructions before doing the task. I advise reading something you find interesting in English. If you just practice IELTS reading texts you will probably get bored very quickly. Here is a good online reading website dreamreader.net there are a lot of types of texts such as academic, general, easy, difficult, fun and so on.